“Khaled Meshaal carried no message to me from the Syrian authorities but I asked him to carry a message to Damascus to help facilitate the job of the Arab League mission in Syria,” said the Nabil El-Arabi, secretary-general of the Arab League, following talks with the Damascus-based Hamas leader Meshaal in Cairo this morning. El-Arabi and Meshaal were both briefing the press following over an hour of talks that they both said dedicated considerable attention to developments in Syria. El-Arabi praised the role of Meshaal and his “advice to, and mediation with, the Syrian authorities,” which allowed for the signing of a protocol between Damascus and the Arab League to send a mission of Arab observers to Syria to inspect the compliance of the Assad regime to end the violence against demonstrators calling for democratic reforms. The mission arrived in Syria on 19 December and will stay 19 January unless its mandate is renewed by both the Arab League and Syria. And according to El-Arabi’s statements today, members of the mission are not having an easy time and the Syrian regime is yet to honour its commitments towards the Arab League in terms of ending the violence, pulling military vehicles out of urban areas, releasing political prisoners and pursuing political reforms. “They are not having an easy time and their task is difficult. 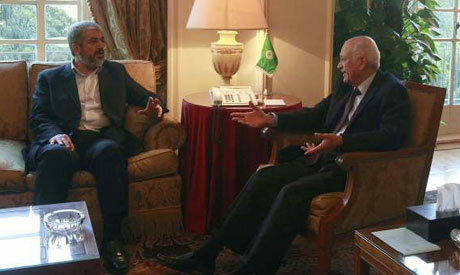 I am sending a message via Khaled Meshaal to ask the Syrian authorities to honour their commitments,” El-Arabi said. Meanwhile, El-Arabi and Meshaal offered no concern over the fate of the Damascus based Hamas leaders should the Syrian regime come into serious trouble. “We did not discuss this matter at all,” El-Arabi said. The talks came less than 24 hours after El-Arabi met with the US Assistant Secretary of State Jeffery Filtman to discuss developments in Syria, in anticipation of an Arab League meeting on Syria on Sunday and a UN Security Council meeting on the same issue on Tuesday.